Do you often require chemical labels urgently, but don’t have the time to produce them? Do you find it difficult to keep up with the latest changes in legislation? Do you have a limited budget for labels and don’t want the cost of large print runs & expensive labelling software? If so, Hibiscus has the perfect solution – we provide a professional, affordable label printing service that caters for businesses of all sizes. We can produce various quantities of personalised, fully compliant warning labels for the supply and transportation of hazardous goods. • Hazardous Goods Labels / Chemical labels compliant with GHS/CLP legislation (in up to 12 languages). • Overprinting (part and pre-printed) using customers own bespoke labels and blanks. • Barcode labels in most common formats e.g. EAN128, Code 2 of 9. • Product labels /Pallet labels /Drum labels. Our bespoke Chemical Label Printing Service is convenient, quick and reliable. We can personalise your labels to include full colour logos, QR Codes and other corporate branding details and each label is always proofed prior to printing, which means that you have complete control over the final product. Using our label printing service can also eliminate the need to store and maintain pre-printed label stock across different locations. 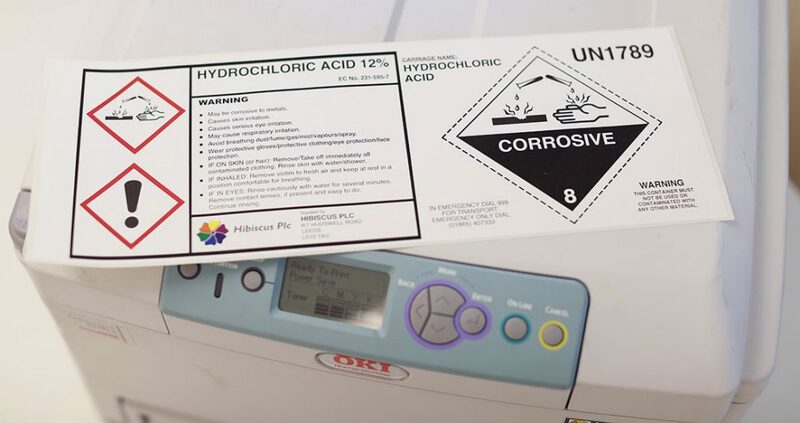 Hibiscus Plc is one of the UK’s leading manufacturers of hazardous goods labels and we’ve been providing chemical labelling solutions for our customers for over 35 years. So if you’d like to take the strain out of it – just leave it to the experts. Call us today on: 0113 203 1942, or use our Contact Form to request further details.